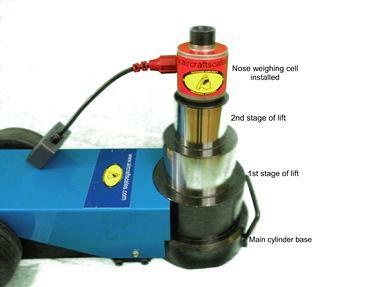 Shown here is one of our under axle air assisted hydraulic jacks. Machined to meet under axle weighing specifications, fully load tested and ready to receive our adapters with load cells mounted. 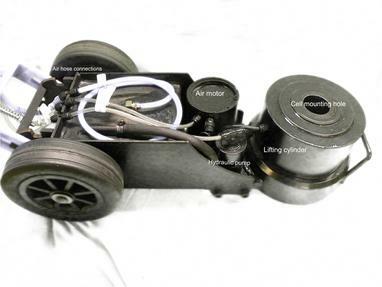 Air/Hydraulic under axle aircraft weighing system. 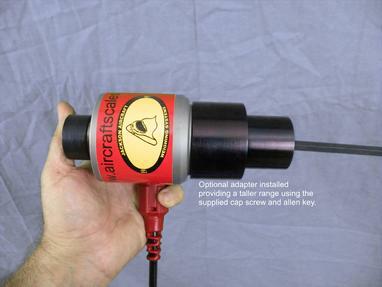 Air operated by your shop air, our air jacks make weighing your large jet easy and saves time. We have 50 ton nose jacks, 80 ton, 100 ton and 120 ton main jacks. Each jack has specific applications for the proper fit and aircraft weight. In addition we have adapter packages to extend or lower the requirement to meet your different axle heights. Our aircraft under axle jacks are two stage lift capable and adapters can be added to add to the lift required for your application. Our air operated, two stage lifting jacks are machined to receive our load cells. Easy height adjustment using our adapter sets makes your jacks capable of lifting several types of aircraft. Under axle system jacks are air operated and easy to use. Shown is an A320 nose axle with standard small format cell. We have other jack sizes for other types of nose applications such as the older Boeing 737 series. 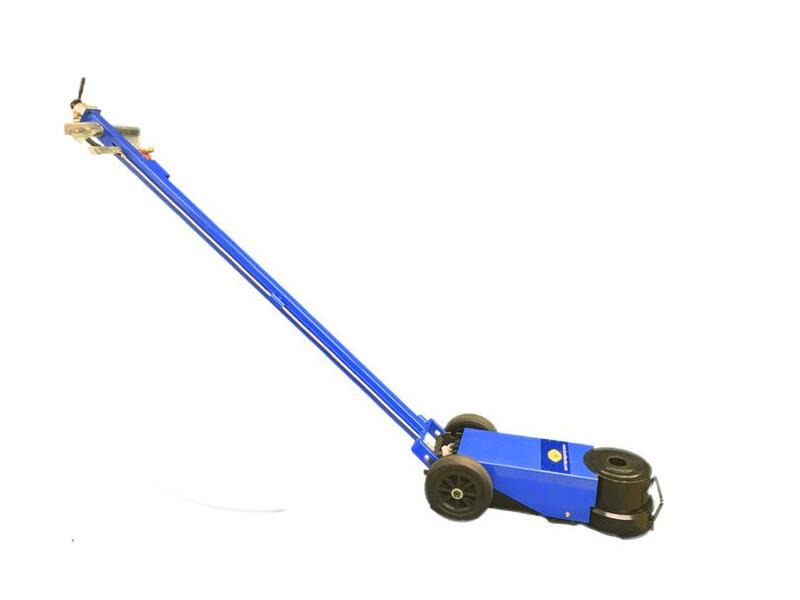 Large jet under axle jacks are the most easy way to jack and weigh your large jet like a 737 or an A320. 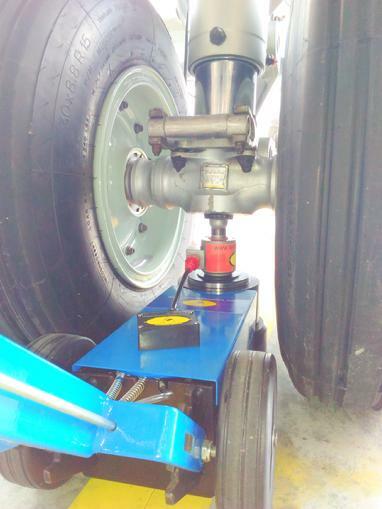 Aircraft weighing using under axle aircraft jacks can be conducted on three point like the A320 or use five points for aircraft like the A330 or 767. Weighing a large jet on our aircraft scales has never been more easy. Pneumatic control jacks coupled with our wireless aircraft scales like the M2400-5-100CS makes your operations easy, cost effective and far more easy to use over platform systems costing twice as much. Each jack is self contained, air drive motor, three stage hydraulic control and locking, air evacuated lowering for retraction with no load, uses standard machine hydraulic fluid. Shown here, our nose cell with low range adapter installed. Our cells use a 1.75 inch mounting adapter and we offer multiple adapter lengths to adapt to the different tire wear and or axle heights.